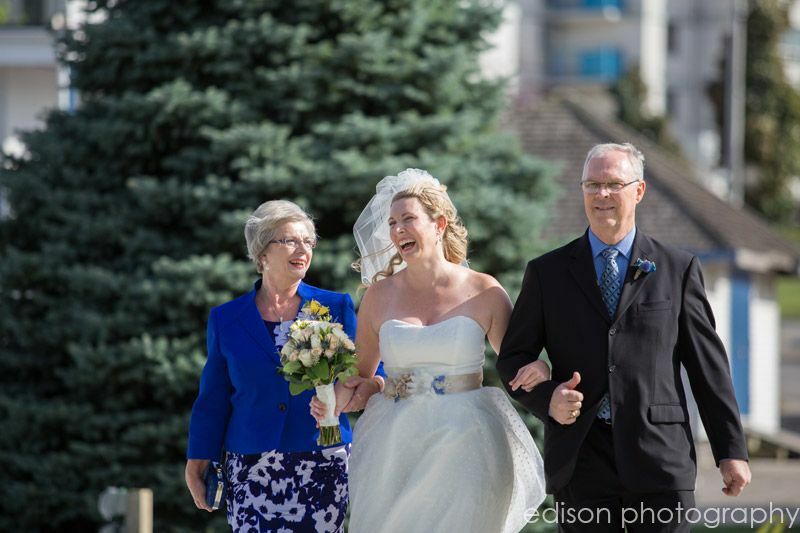 I’ve been waiting to share this wedding – today you can see it also on Wedding Chicks – so it’s time to share it here too! 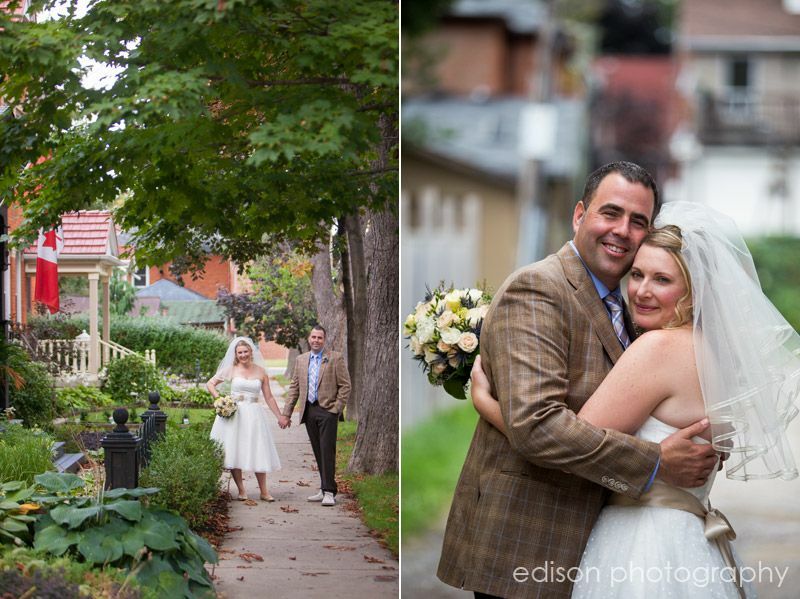 Jen and I have been friends for years and it was such an honour to document their love story. 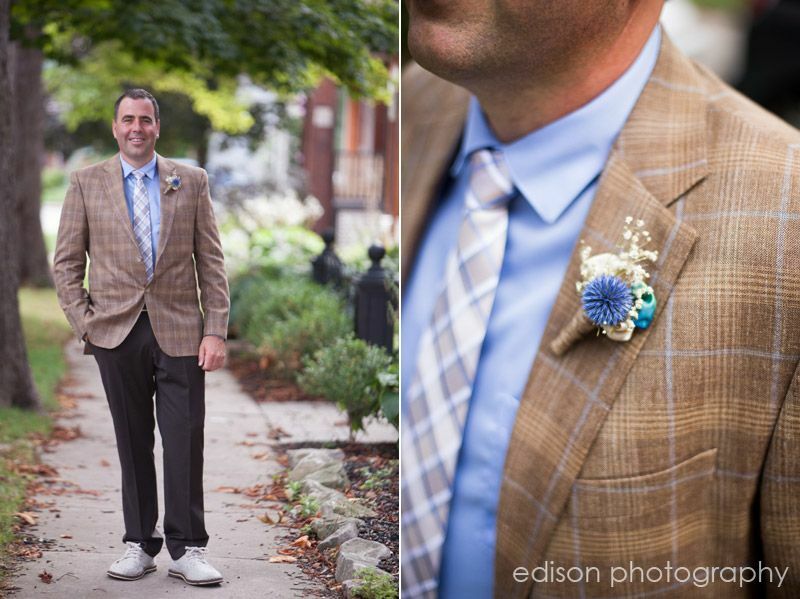 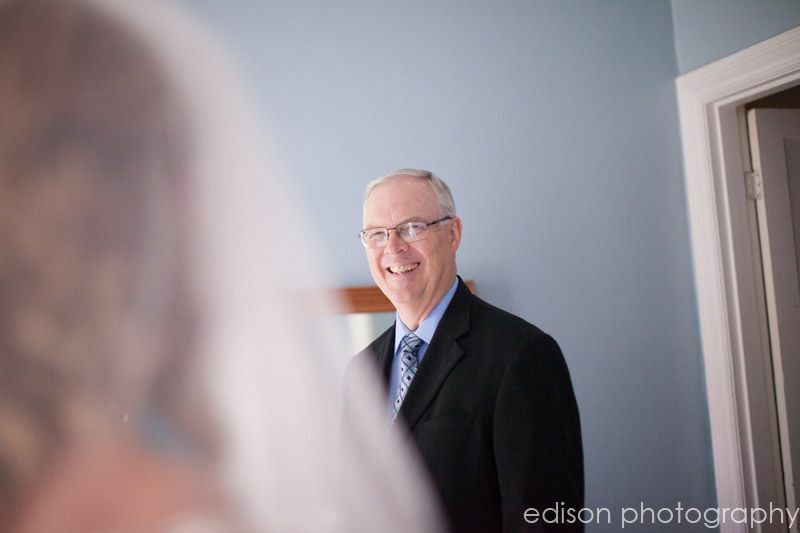 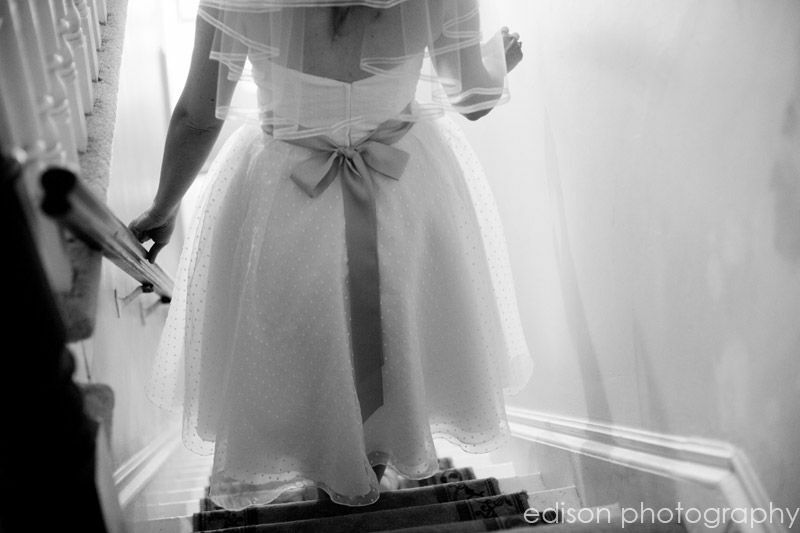 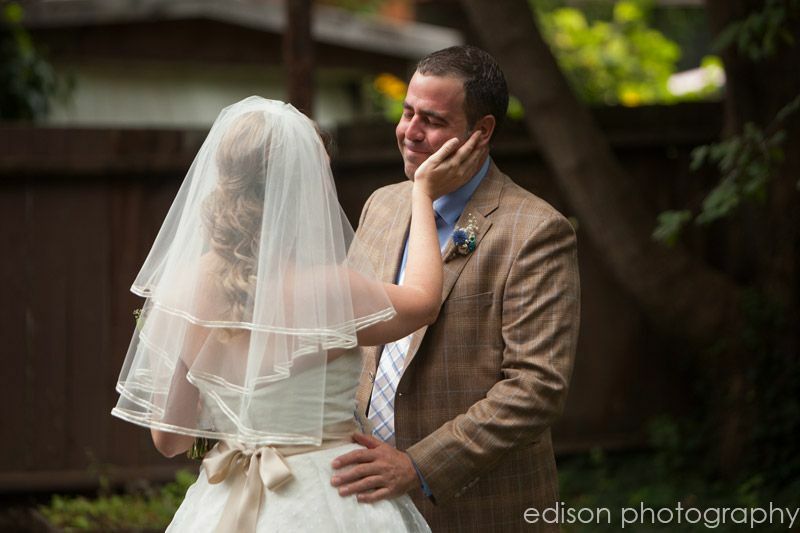 There is so much to tell about this wedding – so I’ll just dive in! 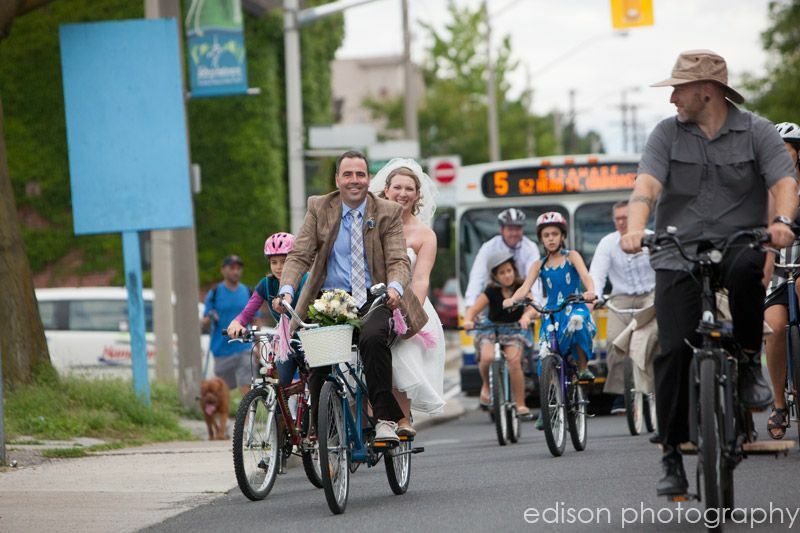 Peter and Jennifer love Hamilton, bicycling and their community of friends and family. 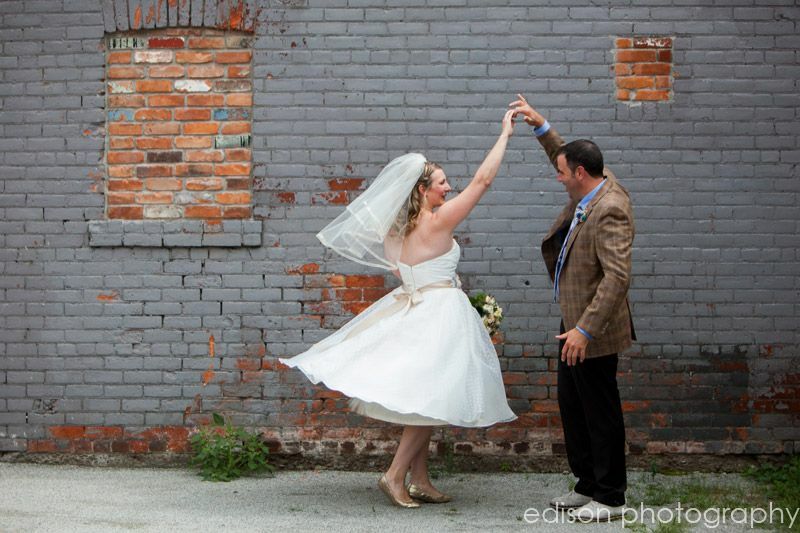 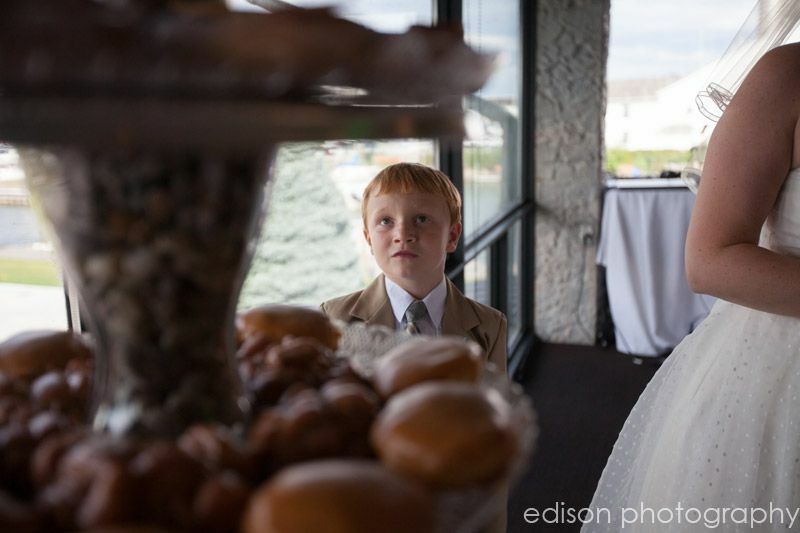 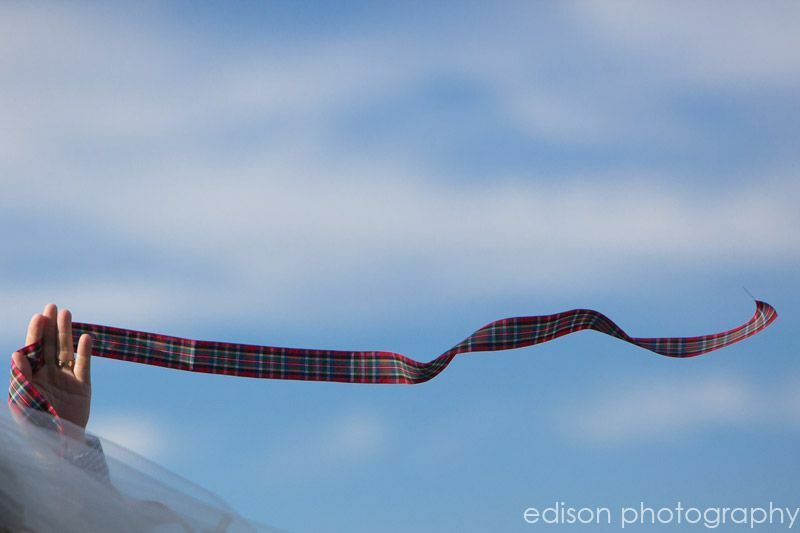 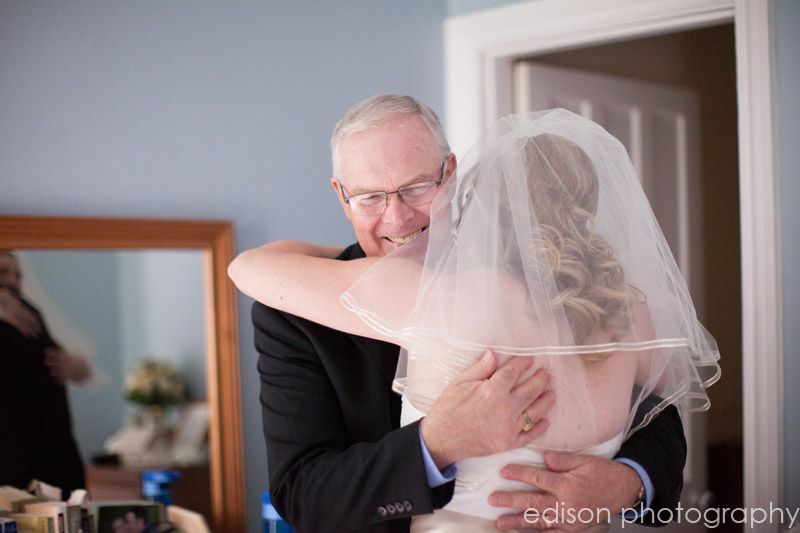 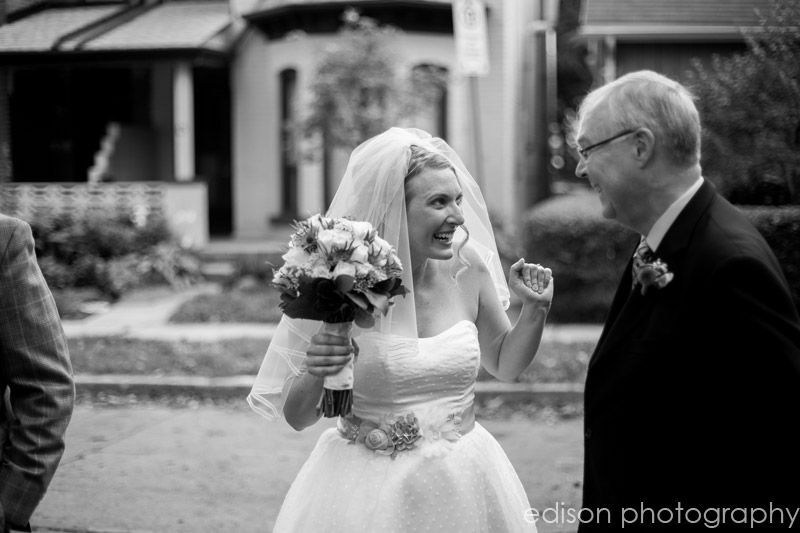 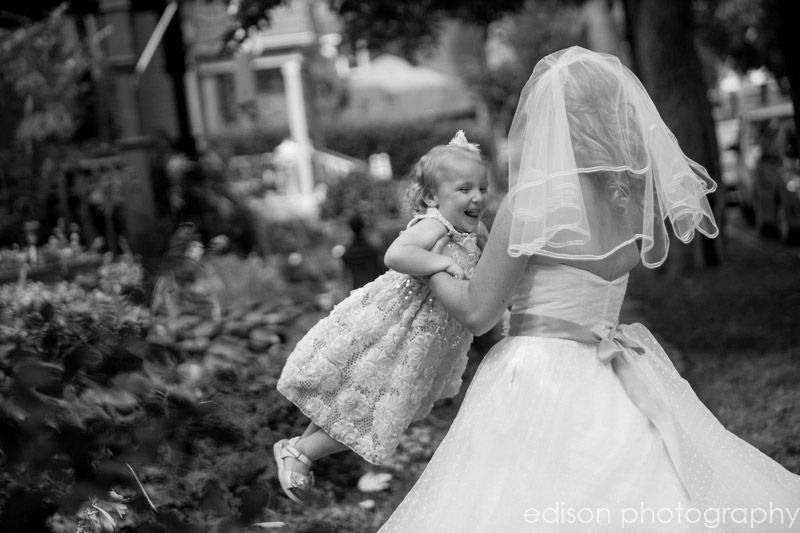 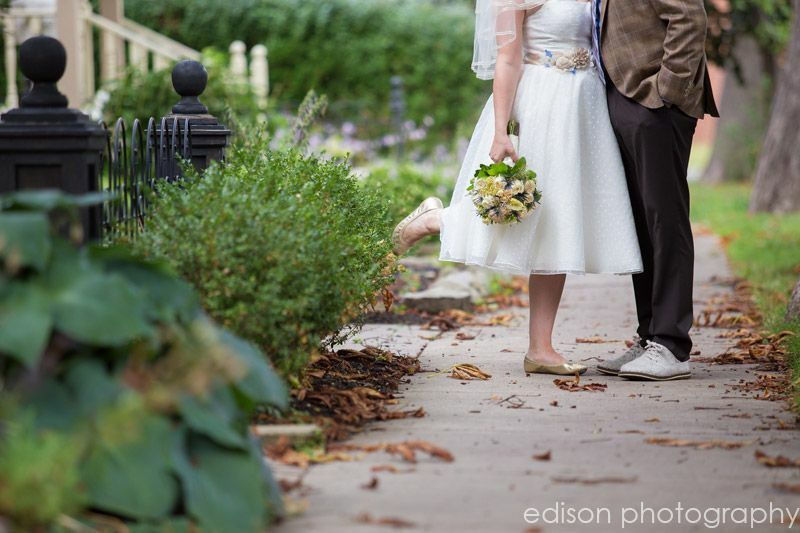 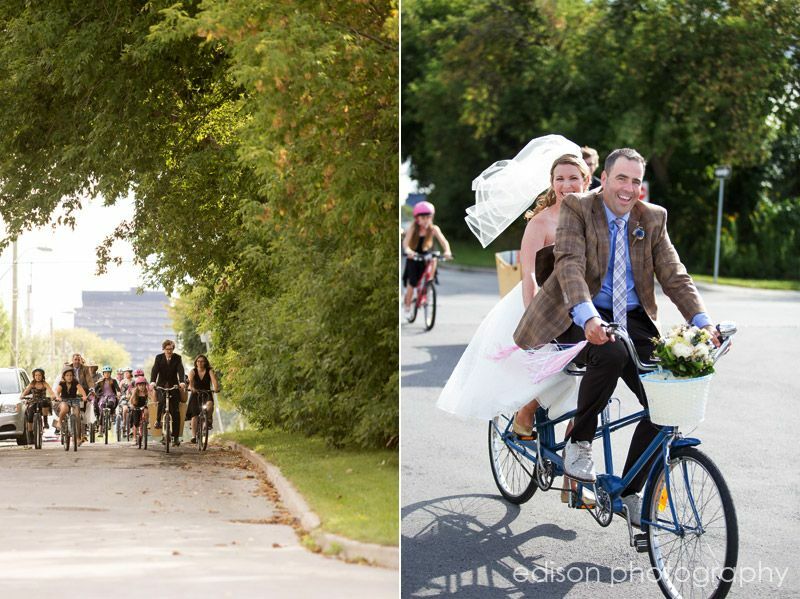 They incorporated all of these passions into their wedding celebration! 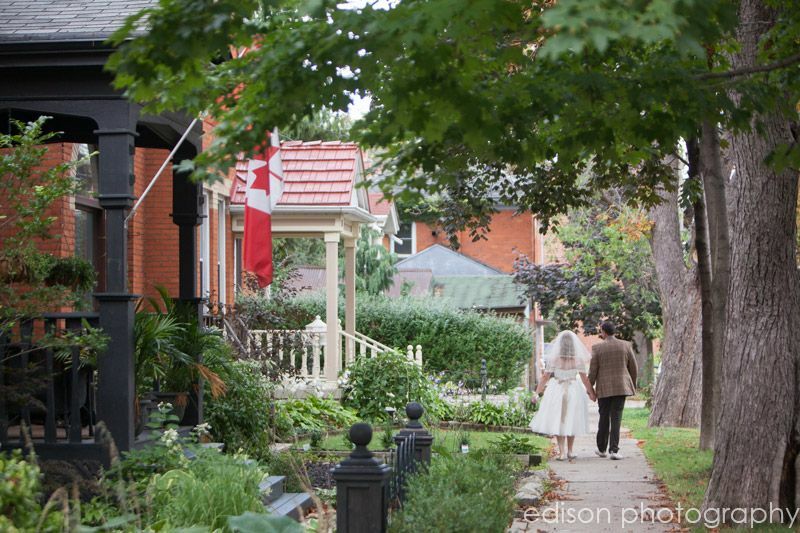 Peter and Jennifer had their “first look” in their own backyard before doing their portraits in and around their own neighbourhood. 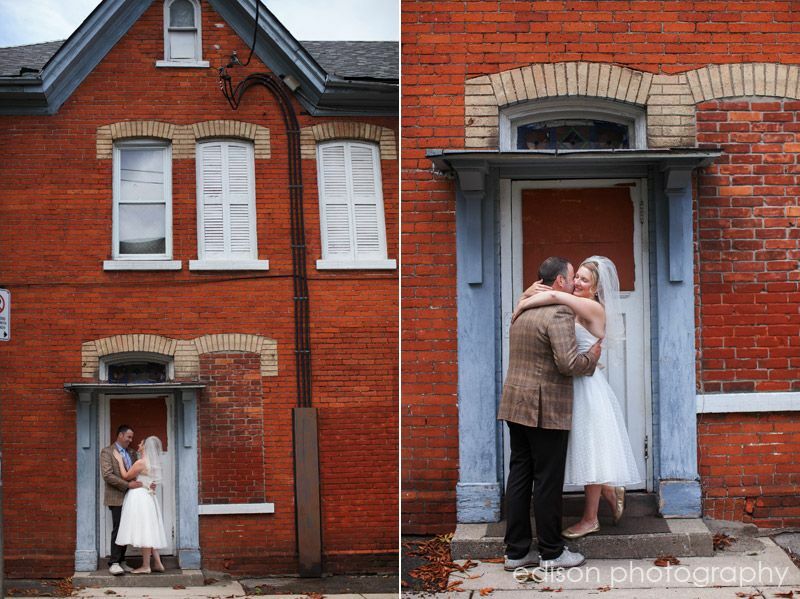 All portraits were taken within walking distance of home. 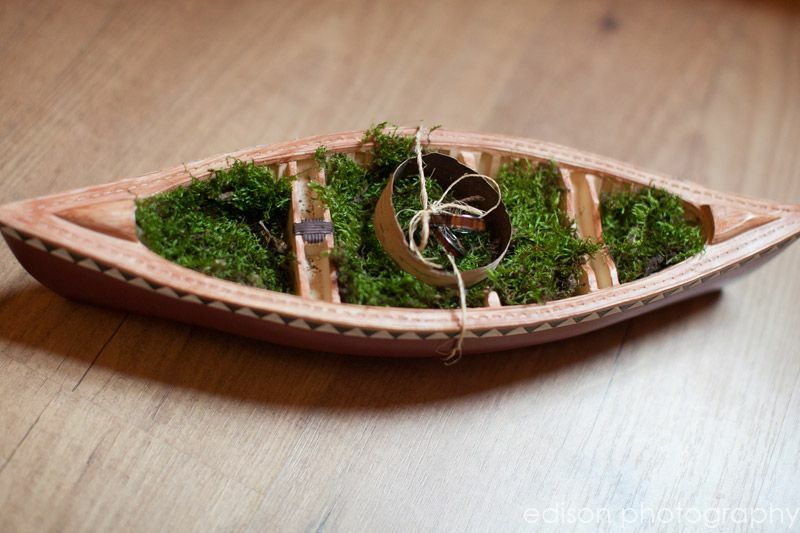 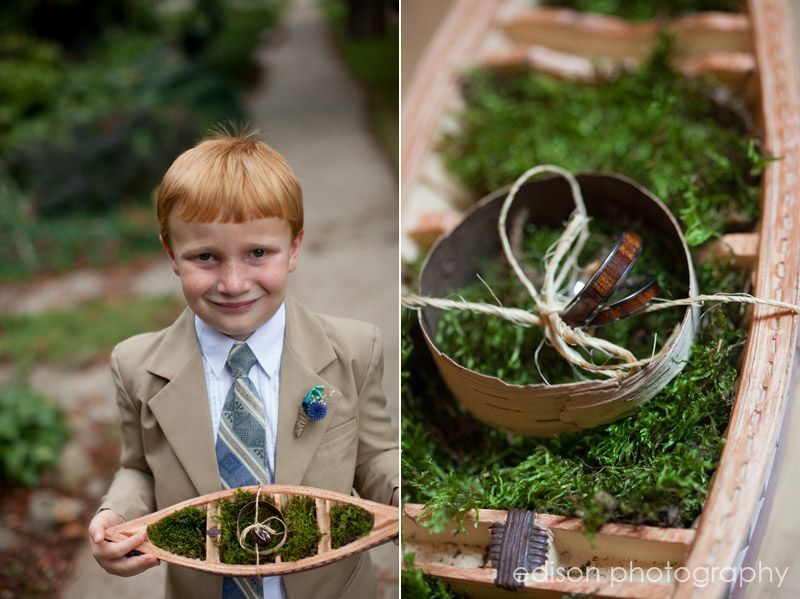 The moss in the ring bearer’s canoe holder was from where they sat to write their vows at the cottage. 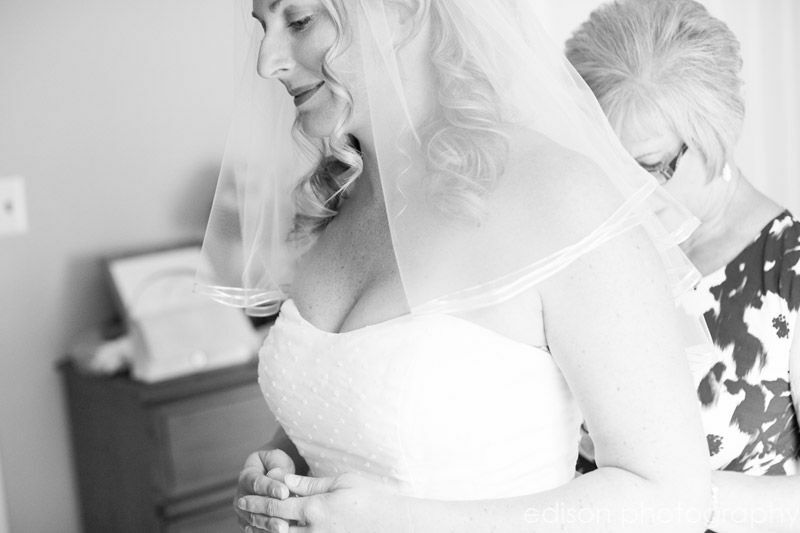 Jen’s mother made the veils for both ceremony and reception. 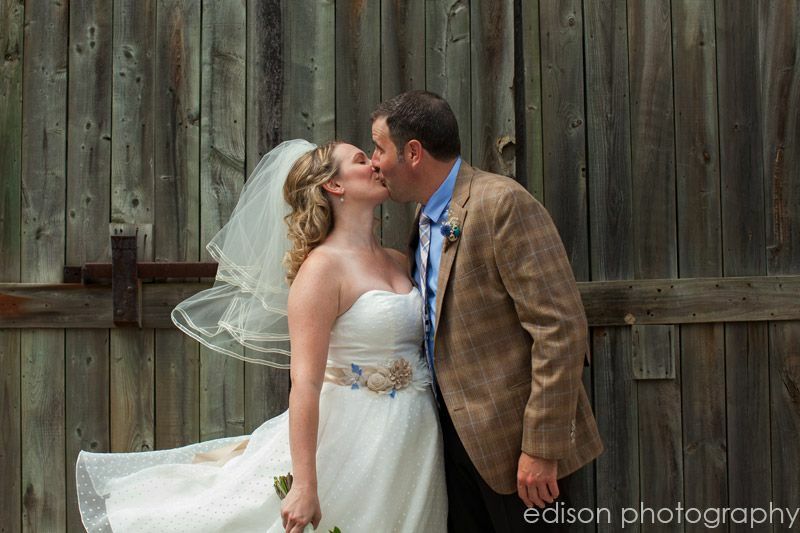 Jen’s earrings were a family heirloom. 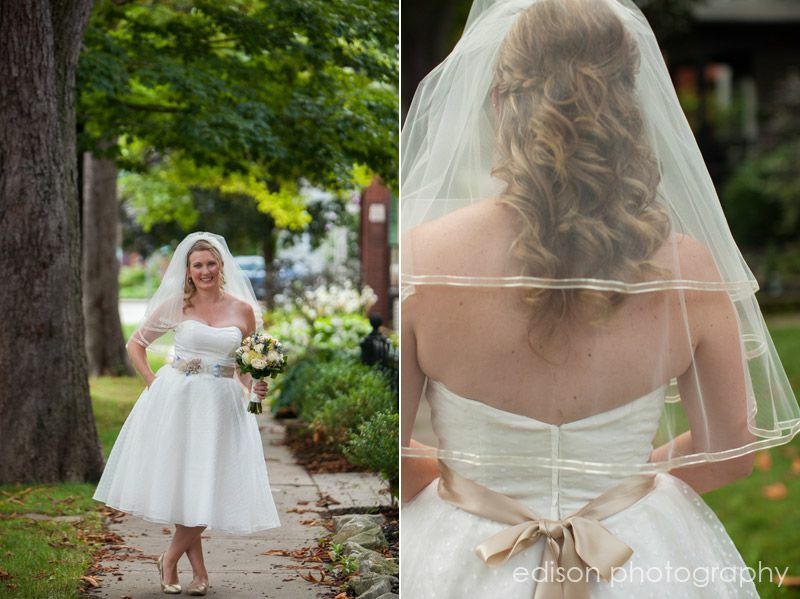 So many personal touches! 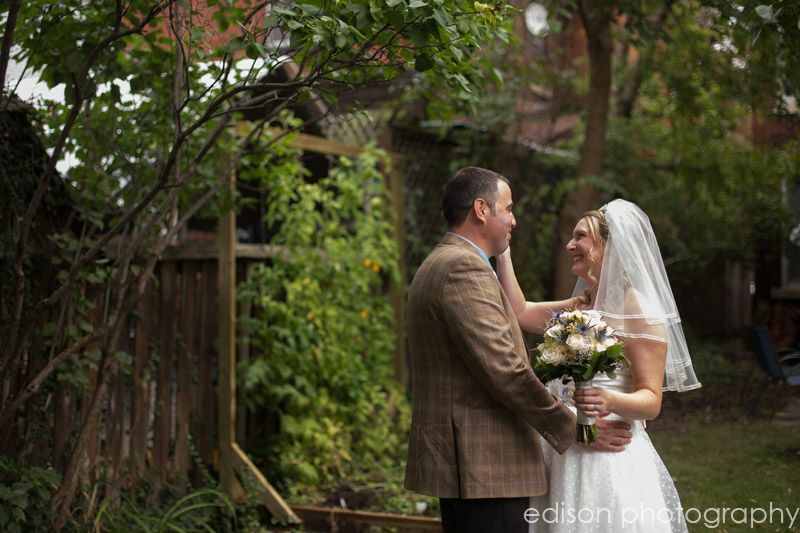 And finally time for the first look in their backyard! 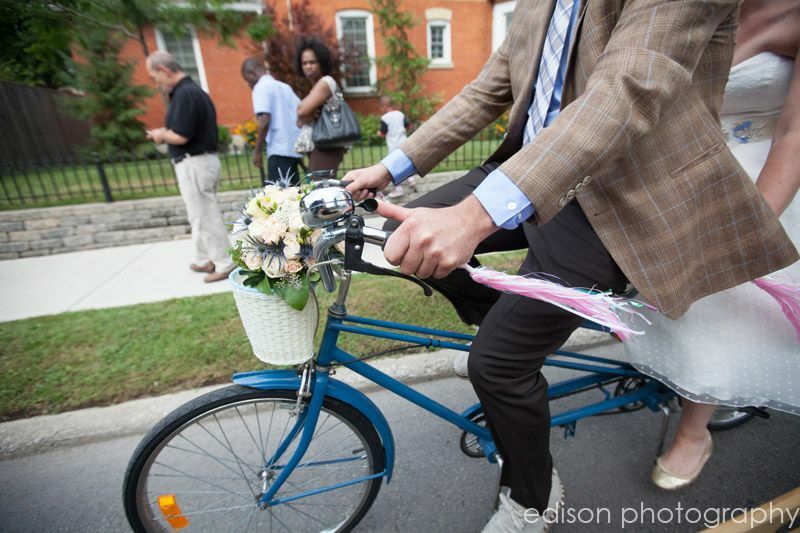 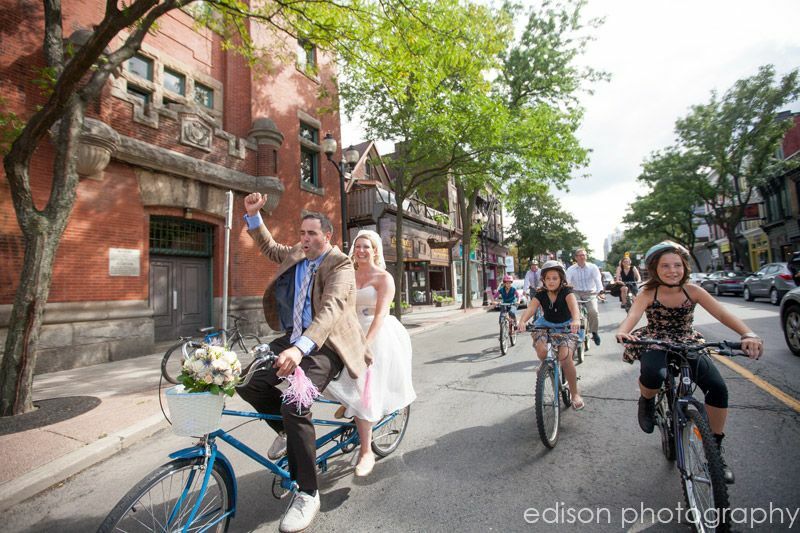 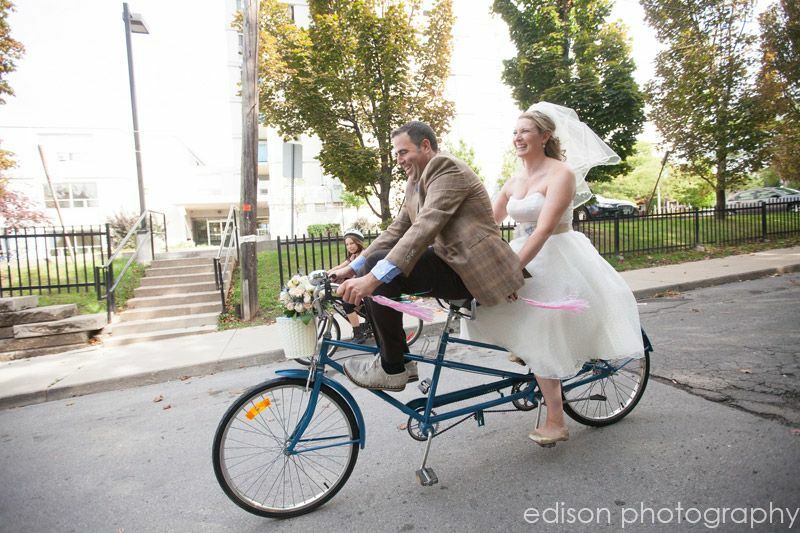 Peter had proposed to Jennifer with a tandem bicycle – and now for their wedding celebration they used it to ride from home to the ceremony! 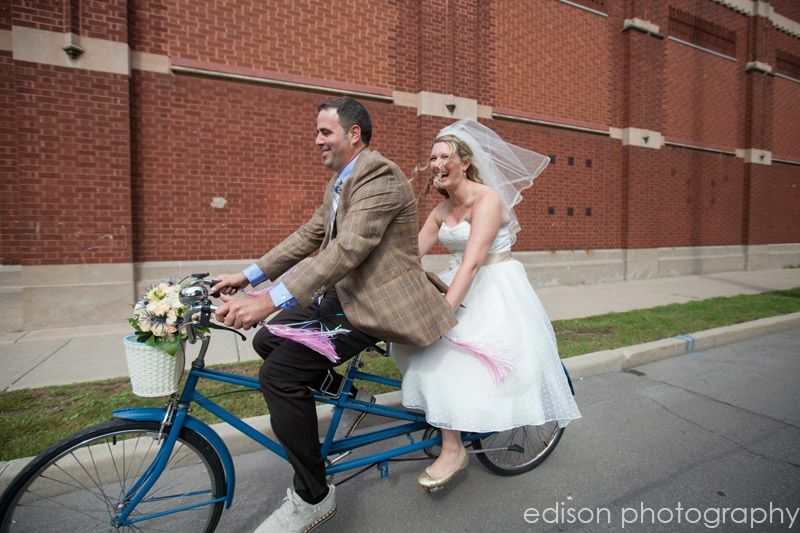 But not only did they ride – they extended an open invitation to any guests who would like to ride with them. 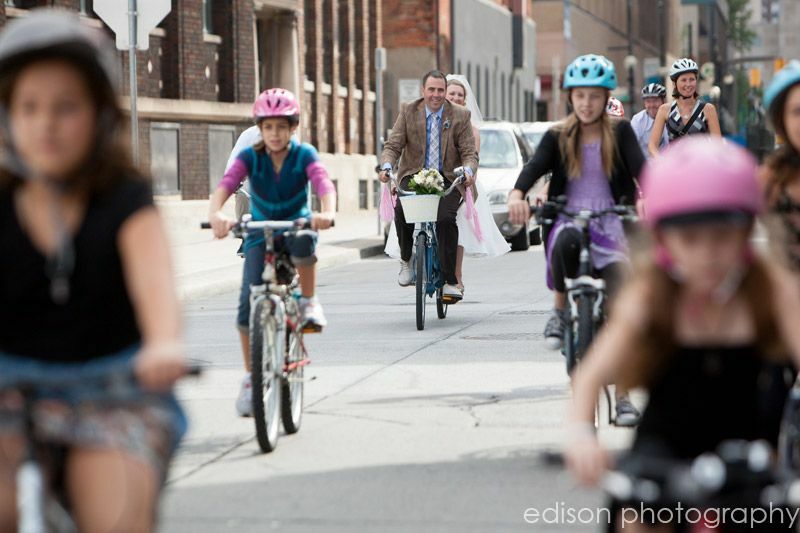 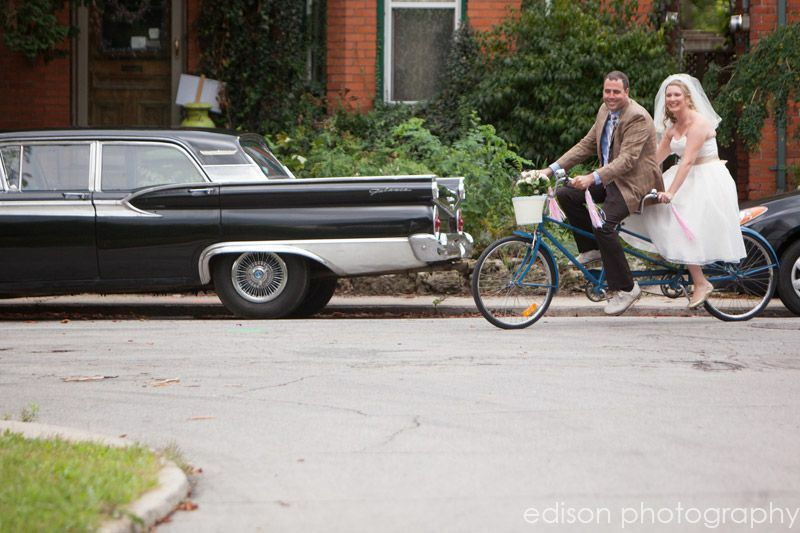 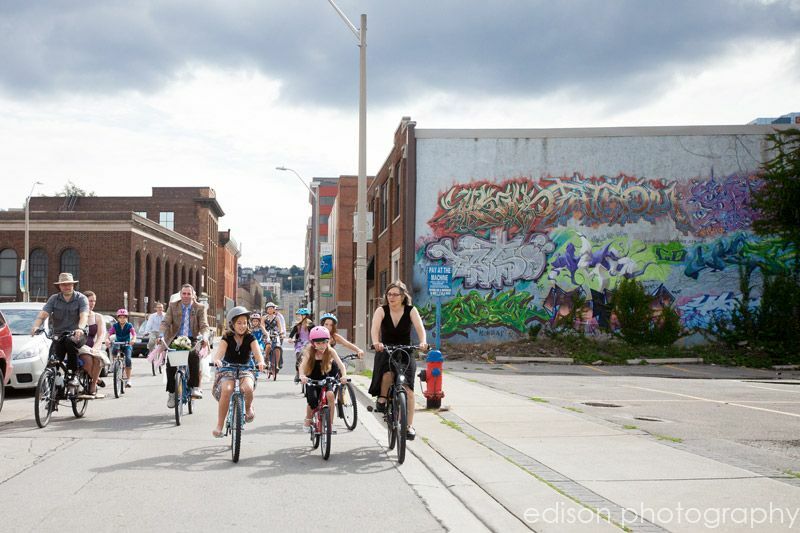 Friends – adults and children – joined in the ride through downtown Hamilton, Ontario. 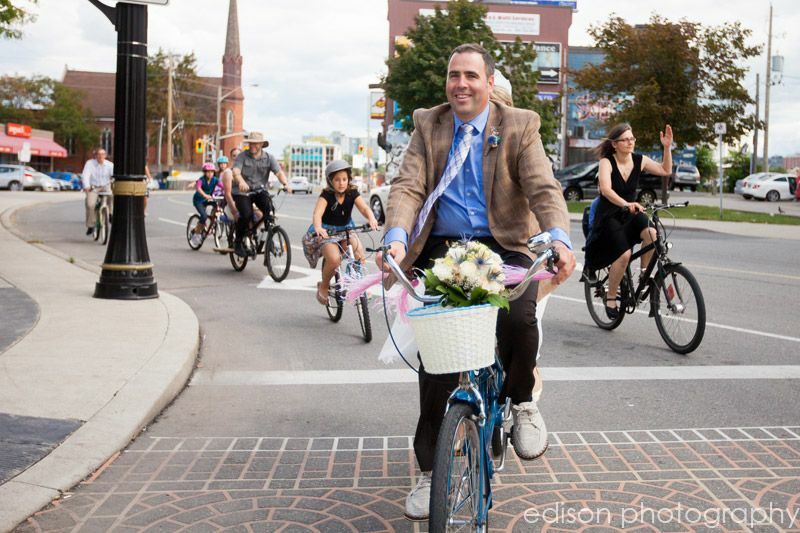 It was such a celebration as they rode – the riders rang their bike bells, cars honked and waved, people cheered and shouted out congratulations! 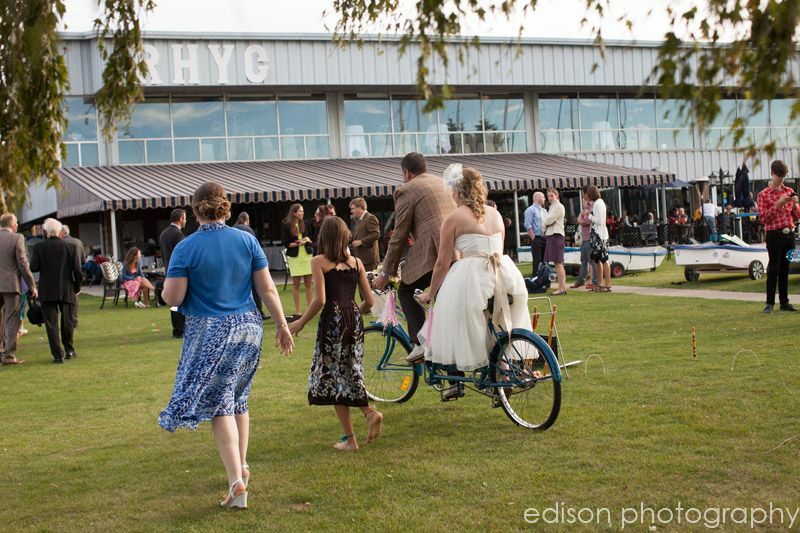 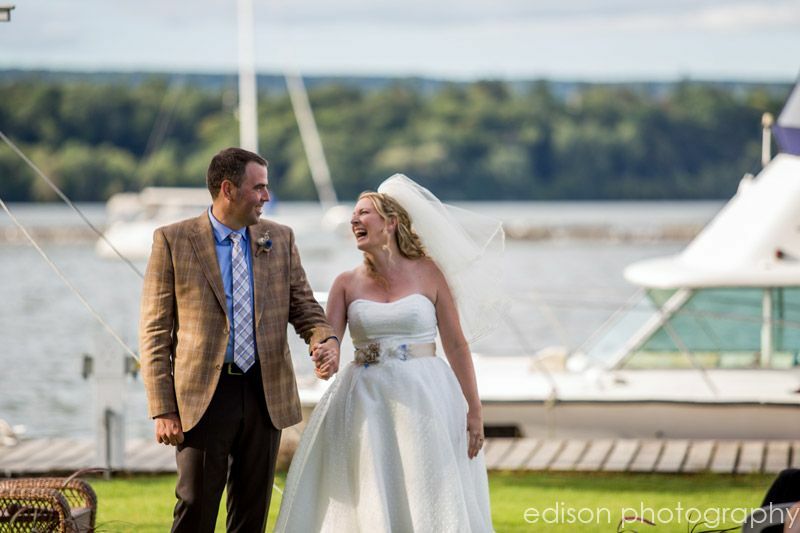 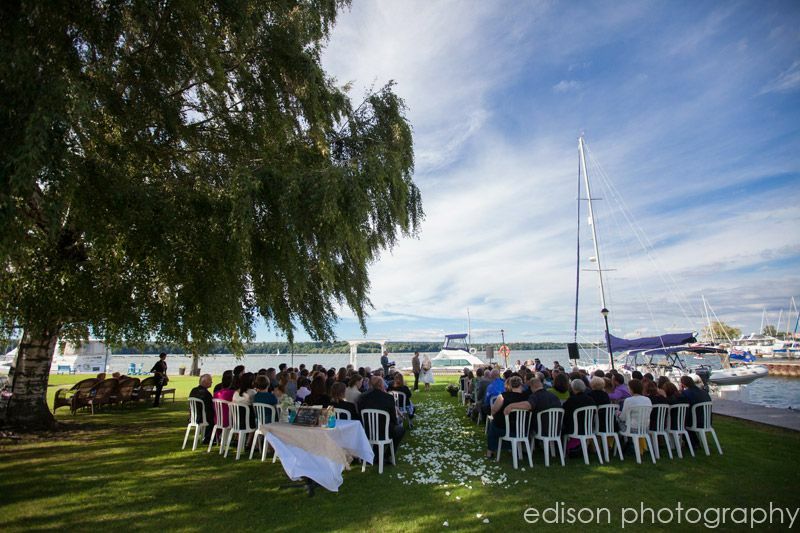 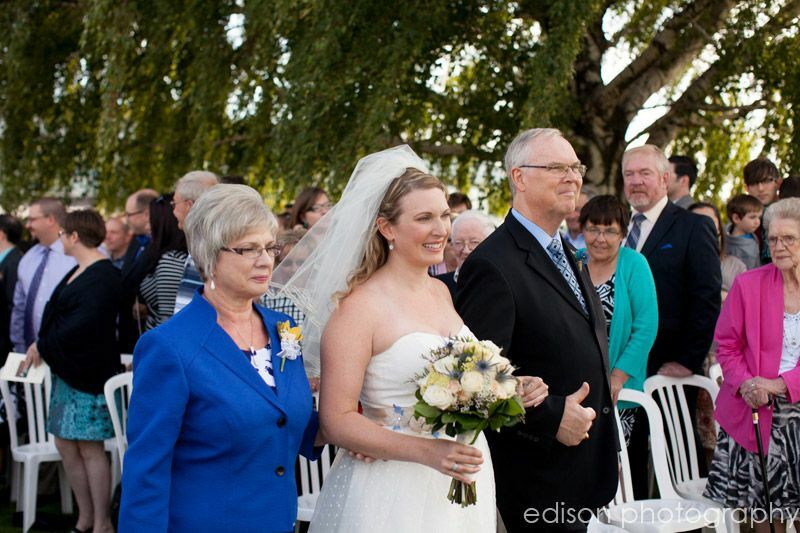 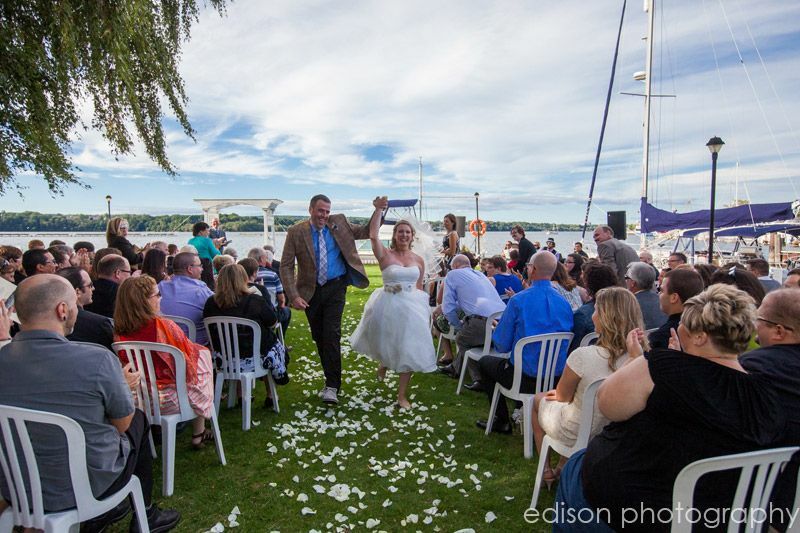 At the Waterfront Centre – where their ceremony and reception were to be held – guests enjoyed the view. 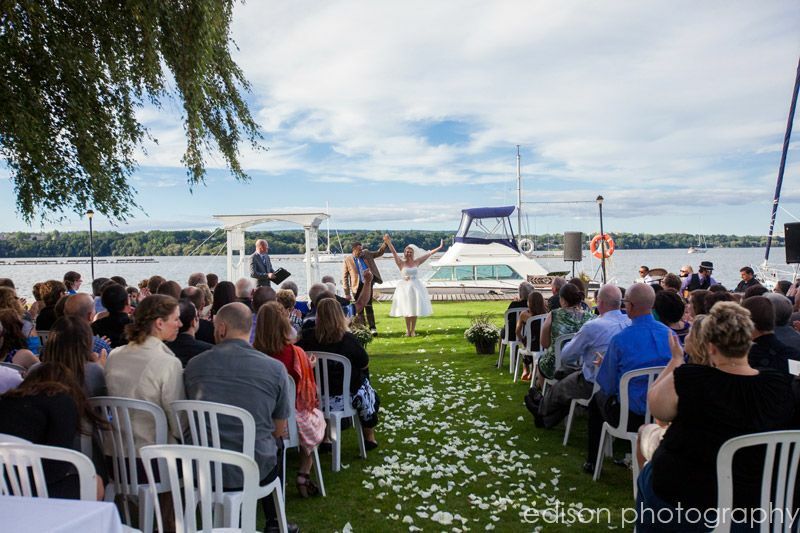 The ceremony had more personal touches – with no attendants (all guests were participants instead!). 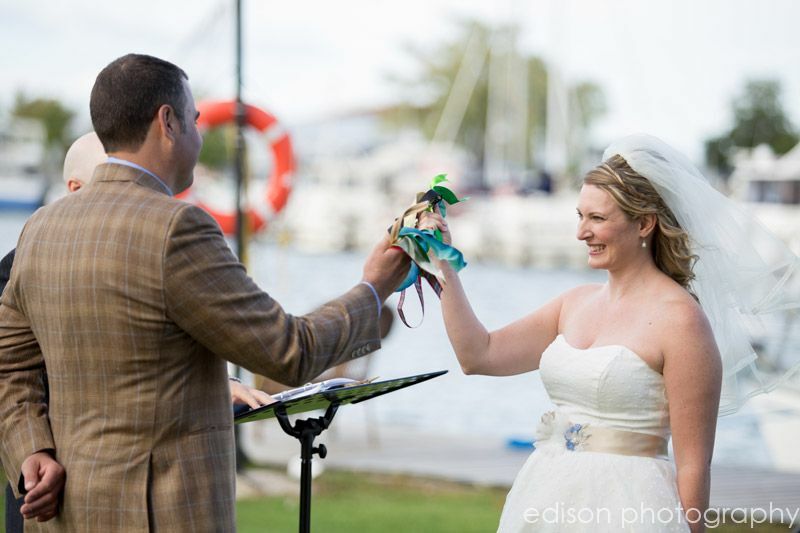 One beautiful part of the service was the binding ceremony where Pete and Jen literally tied the knot! 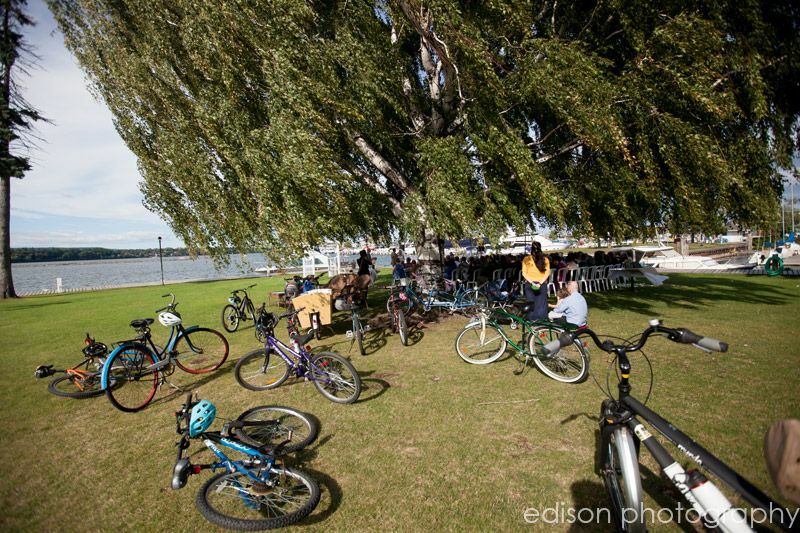 They had asked specific groups (family for each side, community groups they are involved in, work place, church, etc.) 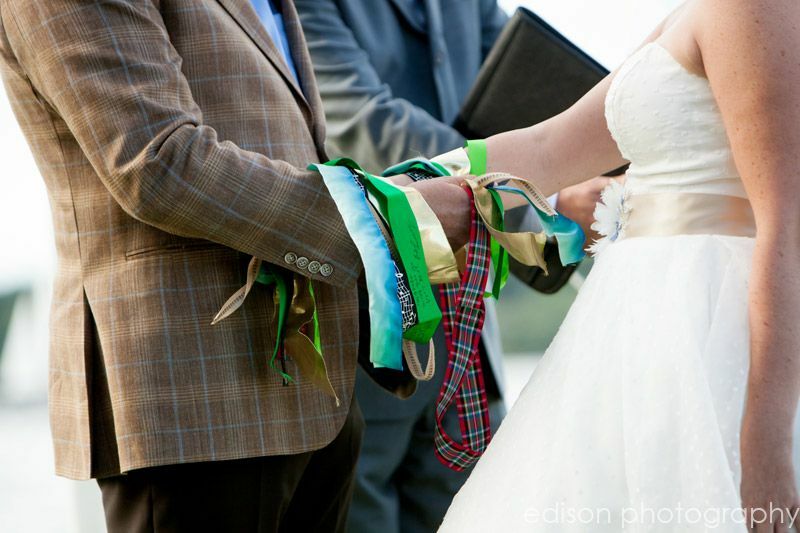 to choose a ribbon with meaning specific to that group. 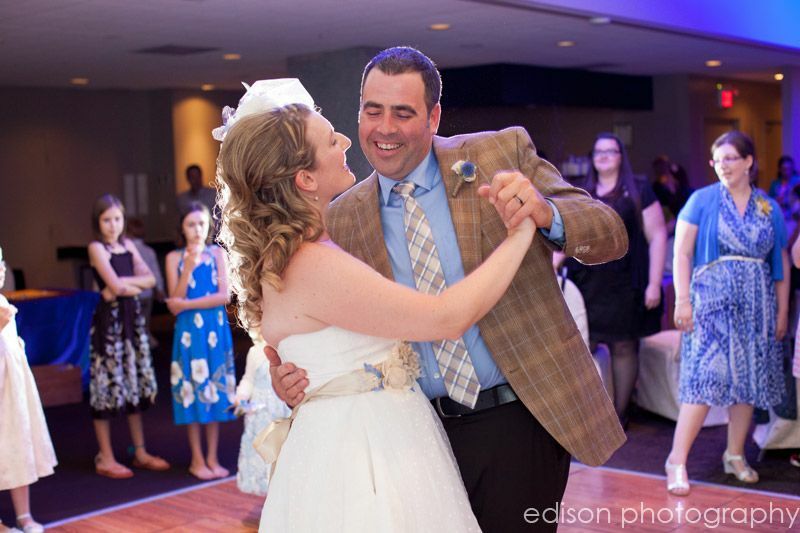 For example – Pete and Jen’s own ribbon they chose was an ombre blue ribbon going from dark blue to light blue – the two colours combining into one with no clear distinction where one ended and one began. 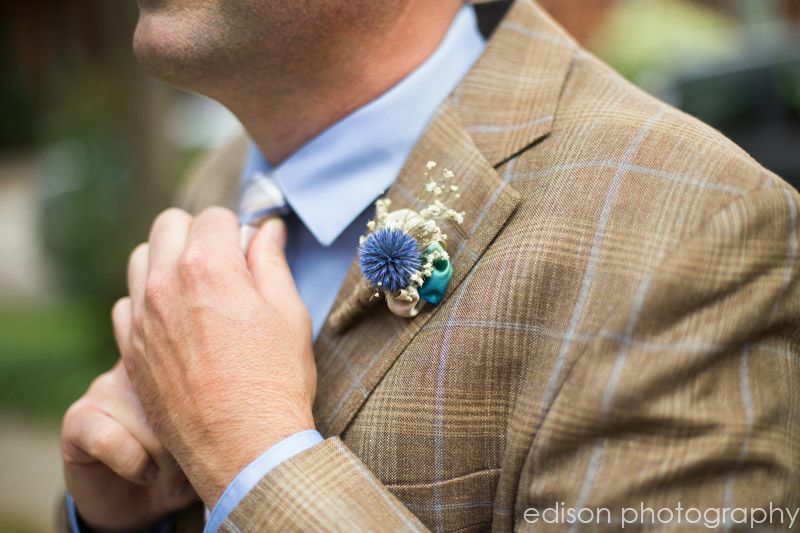 (This ribbon was also used in the boutonniere’s the couple made.) 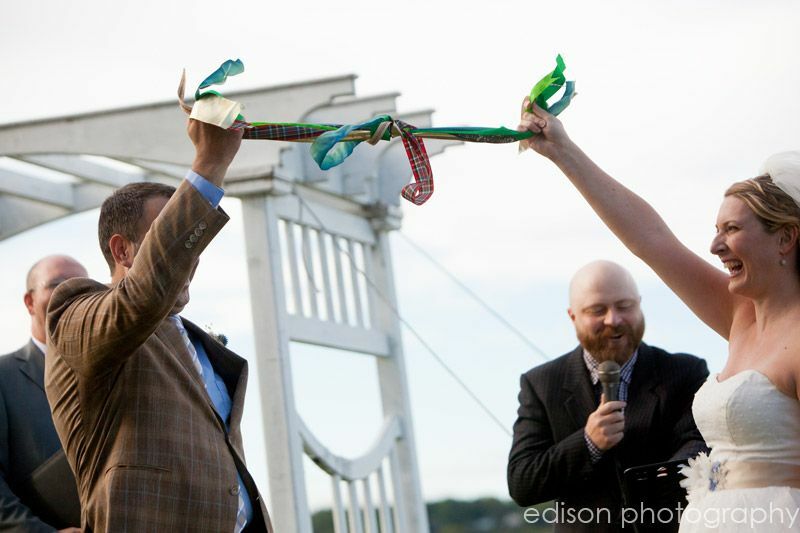 Randy – a good friend and minister – shared the meaning of each ribbon one at a time. 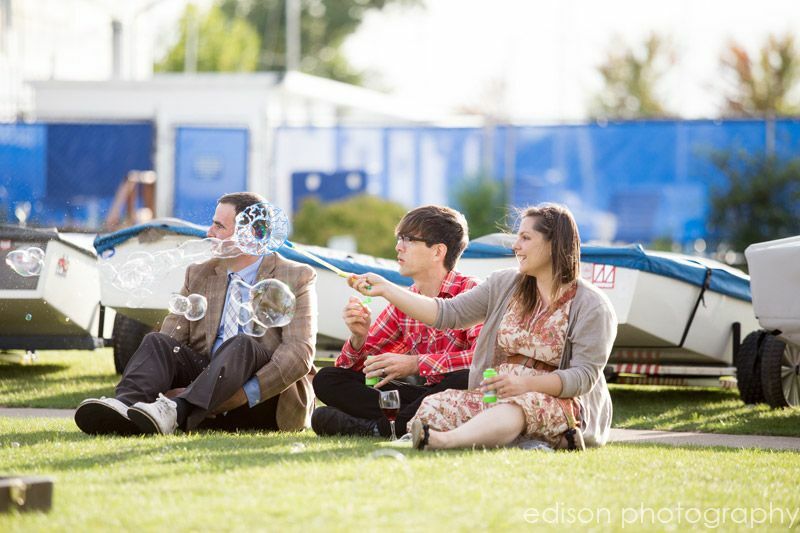 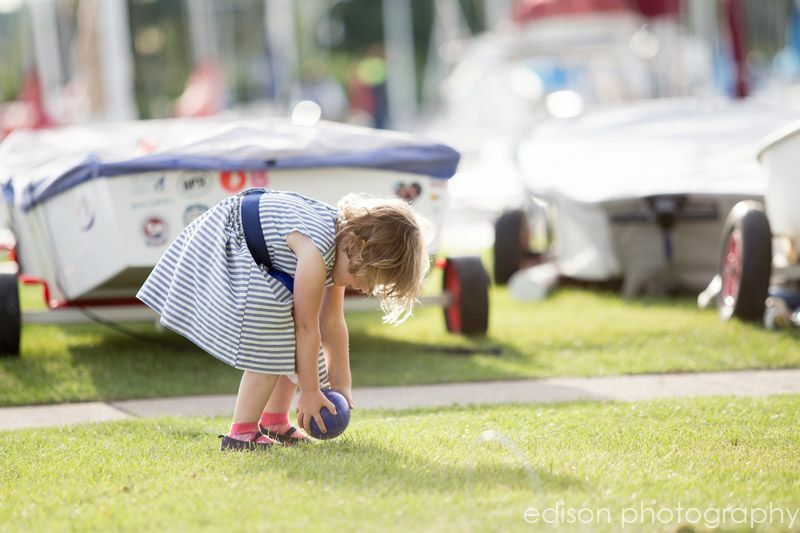 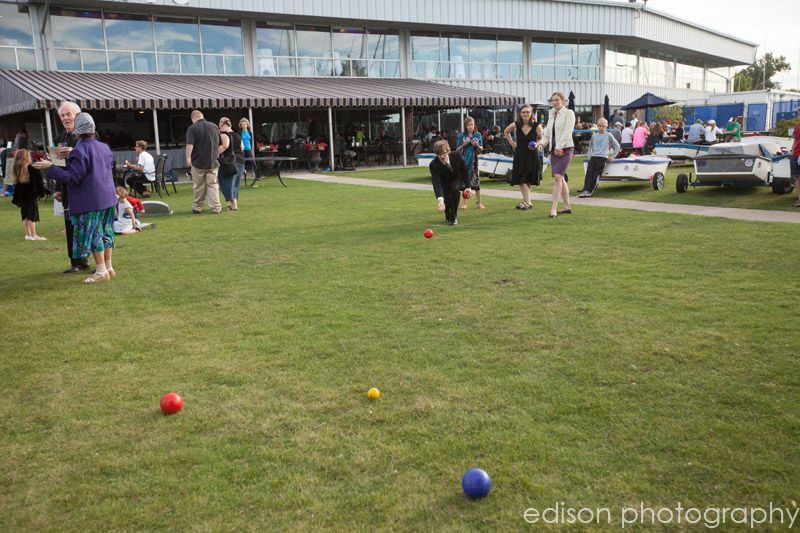 After the ceremony, the guests enjoyed lawn games – bocce ball, bubbles, croquet and more. 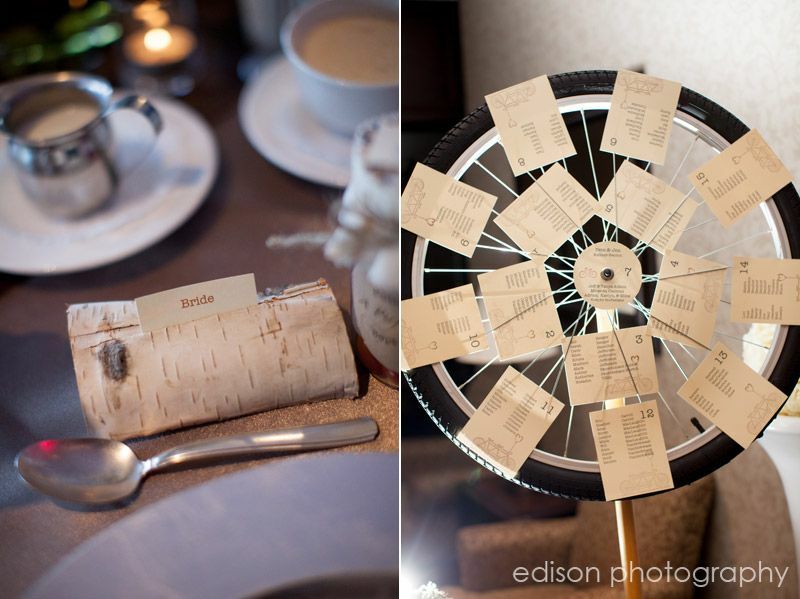 The reception seating also reflected the couple’s desire to be with their guests. 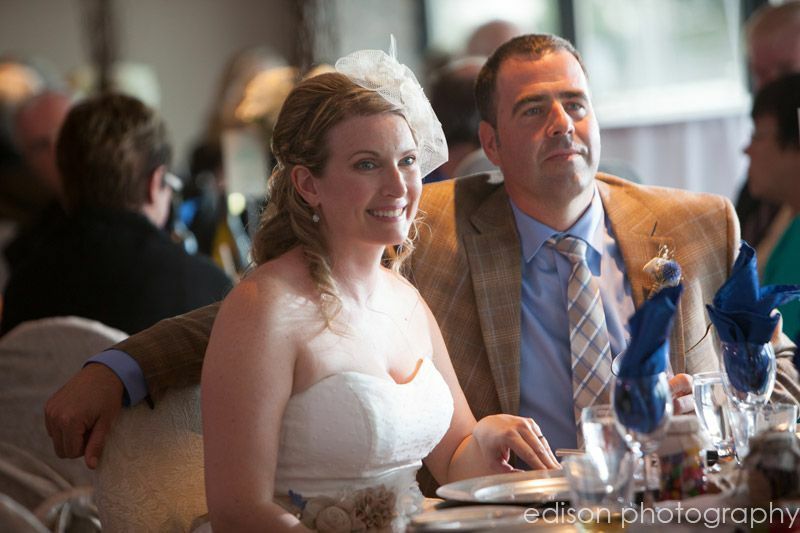 Instead of a head table at the front – Peter and Jen sat in the middle of the room at a table with other guests. 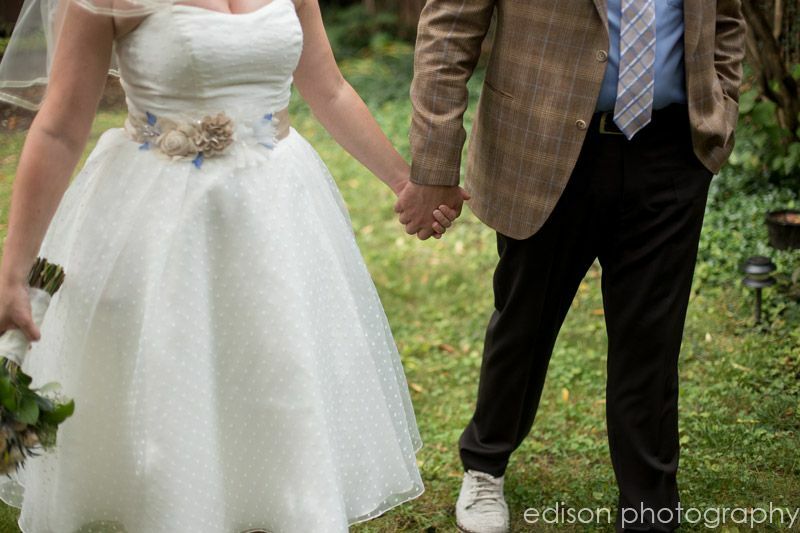 They were able to easily connect with all their guests this way! 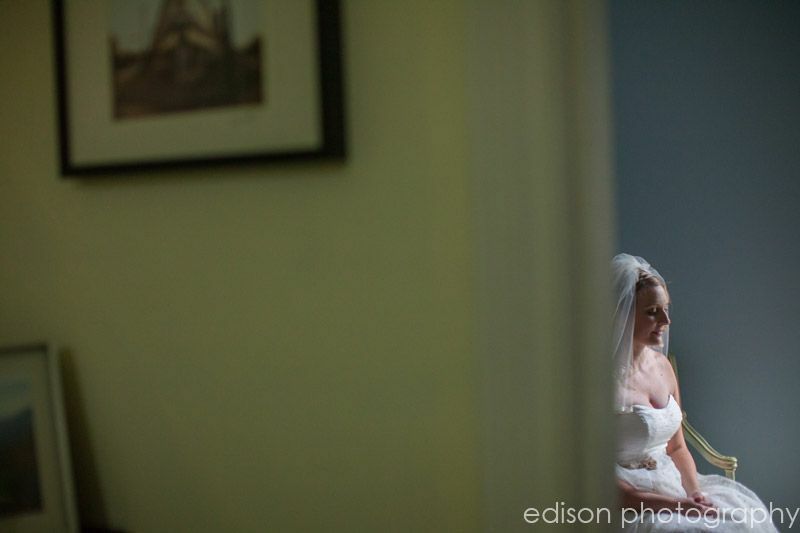 Their special, personalized touches continued throughout the day. 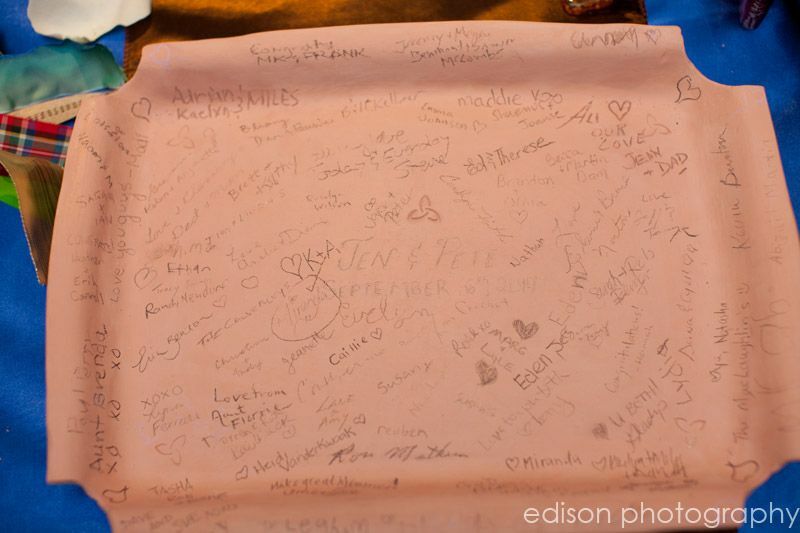 The guestbook alternative was a pottery dish that would be put in the kiln and glazed to make a lasting keepsake. 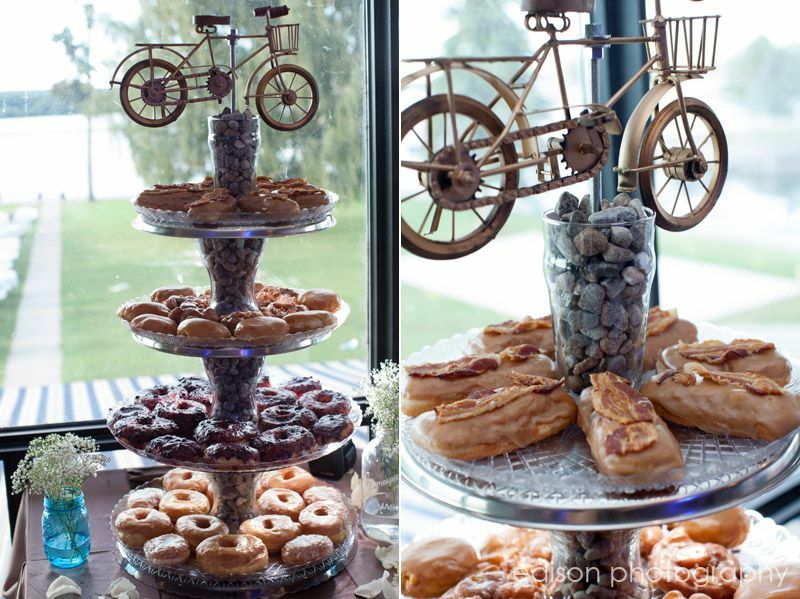 Instead of cake – there were donuts from a friend’s new company including maple bacon donuts! 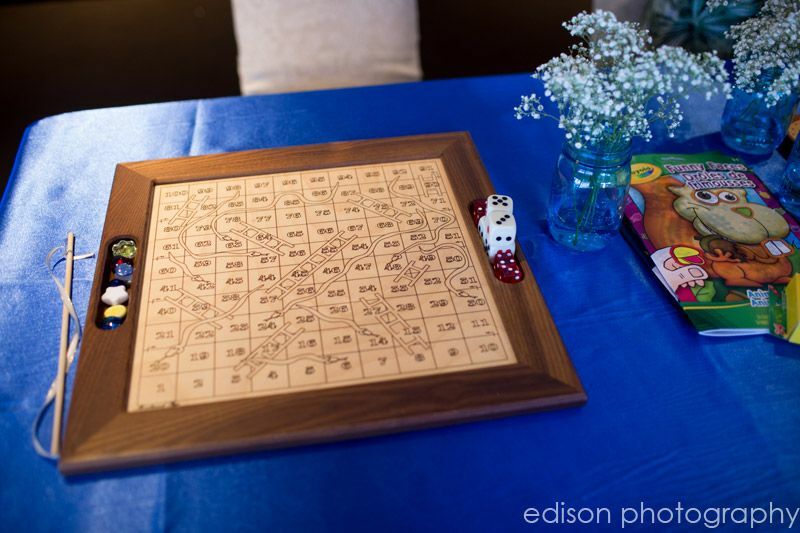 Board games and colouring for kids – or those who didn’t want to dance. 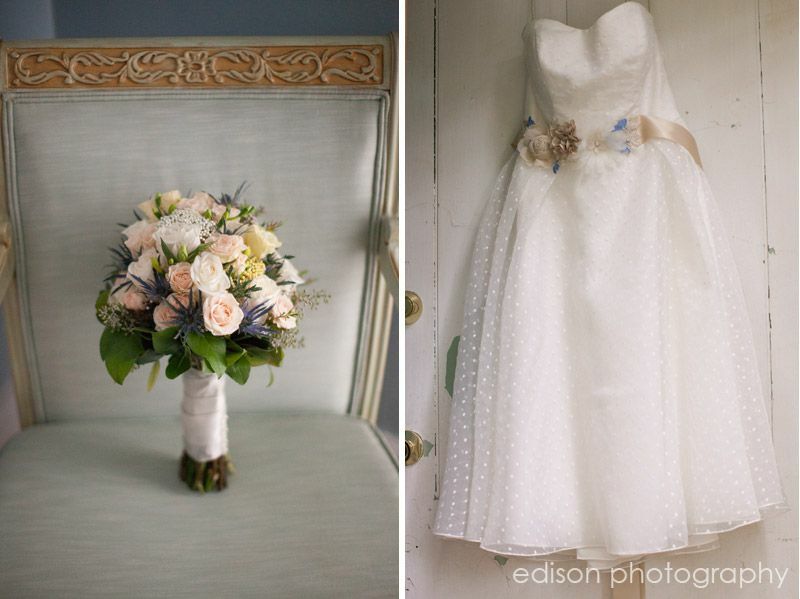 Each item carefully thought through with great intent! 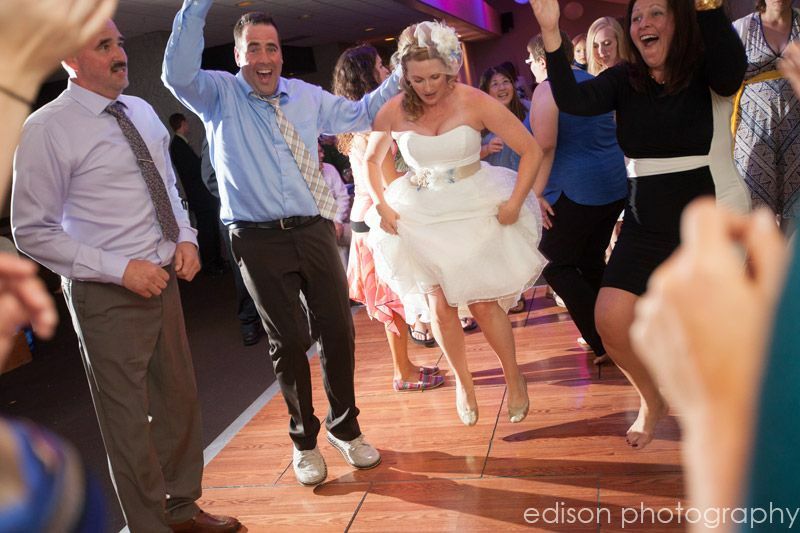 The dance was hopping with young and old out on the dance floor! 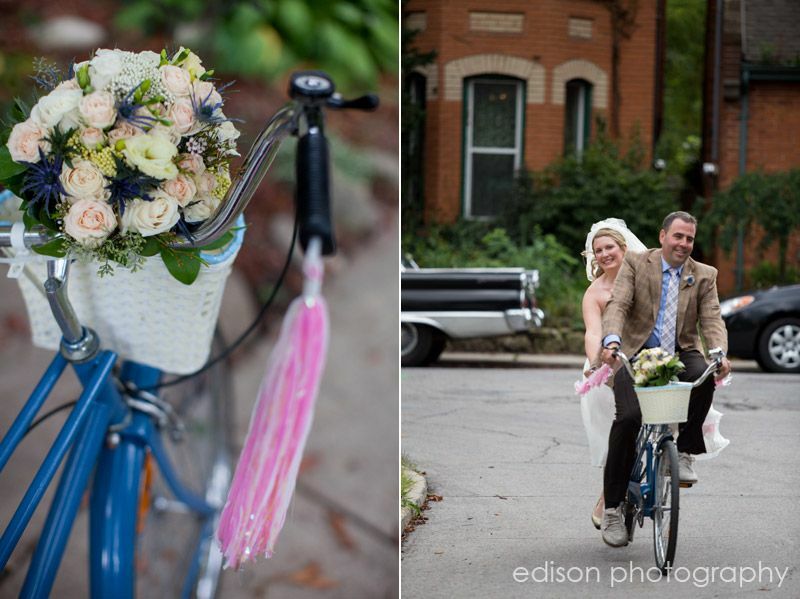 Such a fun wedding full of celebrating love – both Pete & Jen’s and their love for their friends and family!